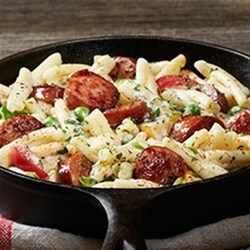 Smoked sausage puts a tasty twist on classic alfredo pasta. Saute sausage in a large skillet over medium-high heat for 5 minutes, turning occasionally. Add cream and Cajun seasoning; bring to a boil. Reduce heat; simmer gently for 3-4 minutes or until mixture begins to thicken. Remove from heat, stir in Parmesan cheese. Add pasta to sauce and toss.